Dedicated to all the hard-working railroaders who have ever hogged an engine, thrown a switch, walked a train, welded a rail, pulled a tie, fixed a circuit, replaced a knuckle, poured fuel or sand, repaired, hostled, cleaned or cursed at a locomotive or a car in the dead of night, in the rain, in the snow, in the glazing heat. You keep America moving, now more than ever. This afternoon I heard the roar of engines approaching a local crossing, so I unholstered my trusty Sony and caught UP 8369 (EMD SD-70ACe, 4,300 hp) followed by UP 5095, a 4,000hp EMD SD-70M. Two other locomotives followed, but I couldn't capture their numbers in the swirling snow obscuring this mixed manifest train. The camera had much difficulty finding its focus in the heavy snow, and the train was having its own set of difficulties as well. Sounding to be in Run 8, the locomotives were working for all available traction, sanders on overtime. With such a new unit, I'm sure the heaters were working effectively for the engineer and conductor. In Union Pacific parlance, a "Z-train" historically means a priority train consisting of time-sensitive commodities, usually TOFC (trailer on flatcar) or single/double-stack (intermodal) well cars. Here, well cars carry single-stack containers (click on photo to enlarge). This Z-train is rather unusual insofar as it is fronted by UP 4579, an EMD SD-70M with 4,000 hp and followed by two other EMD SD-70s. A pure EMD consist is extremely rare indeed. Caught at milepost 148 on the number one (westbound) track, you can see it's about to hit the detector ahead. Note the flaps spanning the width of the track. This detector can sense dragging equipment, hot boxes and locked wheels and axles. Freight speed is generally limited on the number one (downhill) track to 25 mph; it is easy to hear traction motors howling in dynamic braking. Engineers run about 10 pounds of air in the brake pipes downhill. A brief note about single- and double-stack containers over Donner Pass: UP can only run single-stack containers on the Number One and Number Two tracks, as its older Transcontinental Railroad tunnels are insufficiently tall. UP would have dug down into these tunnels in order to accommodate double-stack, but met resistance by enviros who objected to the alleged "ruination" of these historical tunnels. 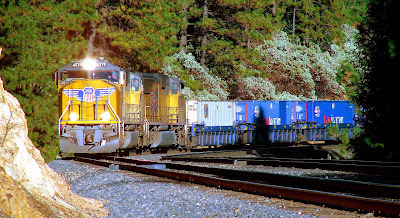 Therefore, east/west northern California UP double-stack traffic must run over the Feather River (formerly Western Pacific) route instead of Donner -- but this adds another 70 miles to the journey. Therefore UP would rather run double-stack over Donner and save mileage but cannot yet do so. That is why you will only see single-stack intermodal Z-train traffic over Donner Pass on the Roseville Subdivision. I am a political junkie who works in the capital of California, and cannot wait to leave the daily bedlam of the valley for my rustic cabin at the 4,000-foot elevation in the Sierra Nevada mountains. My interest in railroads has led to a rekindled interest in photography, video and history. Few things are as impressive as having 15,000+ horsepower pass by my home in Run 8, hence my interest in the Central, Southern and Union Pacific Railroads. One of the purposes of this blog is to display my photographic documentation of the Roseville Sub, specifically the Donner Pass area, as it exists now and in the past. My current challenge is to provide you with views, photos and videos that few people would dare to proffer, placing me in frequent danger. On the other hand, after 6 decades, I'm ready for each and every challenge. Unless otherwise credited, all photographs are copyright (c) 2014 by the blog author.